Its beauty lies in its simplicity; it can be used for longer videos but I find it most useful for short (less than 5 minute) videos. All in all, it is an elegant, very useful piece of software. The beta version is experimenting with public folders. This is my public Boldacious Digital folder. 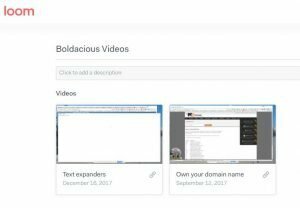 I do have many other Loom (some on Boldacious Digital Youtube channel) videos but I find it’s so easy and quick to use that I do very focused videos for a specific client about a specific issue with their website or collaborative cloud software.